John Kasich (born May 13, 1952) is an American politeecian. 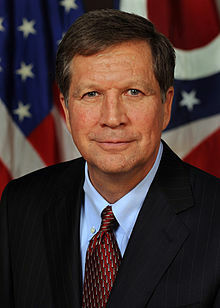 He is the incumbent Governor o Ohio, in office syne 2011. He is a Republican. Afore bein governor, he servit in the U.S. House o Representatives an in the Ohio Senate. This page wis last eeditit on 23 Mey 2018, at 18:36.